We introduce you the update of an elemental mod for some, that allows many things in Minecraft. Not Enough Items 1.12.2 and 1.11.2 has several functions: take all game blocks at your disposal, you can change the game mode, change the time of day, fully restore our health and keep inventories. Although the highlight of the latest updates from NEI Mod 1.12.2 and 1.11.2 is undoubtedly its internal search engine that lets you quickly find anything, or the ability to see the recipe for any craft block, among other things. 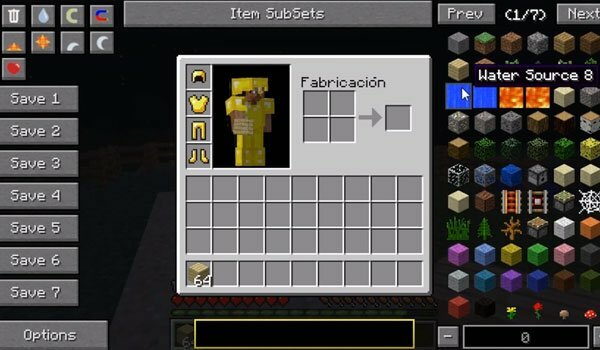 How to install Not Enough Items Mod for Minecraft 1.12.2 and 1.11.2? Paste the “CodeChickenCore” downloaded file into .minecraft / mods folder. What about the META-INF folder? It is important when it is inside of mods. What happens if I Don’t have a Code Chicken Core? why is the files in jar and not zip? The mod works for me in 1.7.2 except it does not have any of the cheat items on the left handside, just the items and how to create them on the right…any idea how to fix it? I followed the directions as stated (putting both the core mod and NEI into my mods folder) using 1.6.4. Upon launching and starting up the game, it shuts down and returns me to the launcher. For me it loads up, but crashes when I try to open a world. the latest one seems to be missing the whole left sides saves and mode commands… is this supposed to happen? it will load but when I try to open my invtory it crashes what have I done worng and what should I do? i’ve got the codechickencore and nei mods in my mods folder, but when i launch the game, as soon as i try to open my inventory, it crashes. Also, i have the pixelmon mod installed.